I arrived at the office this morning to find this sweet little Box Turtle in a dishpan on the conference table. My co-worker wasn't in the office at the time, but he was on campus. He must be the reason this little one is visiting. 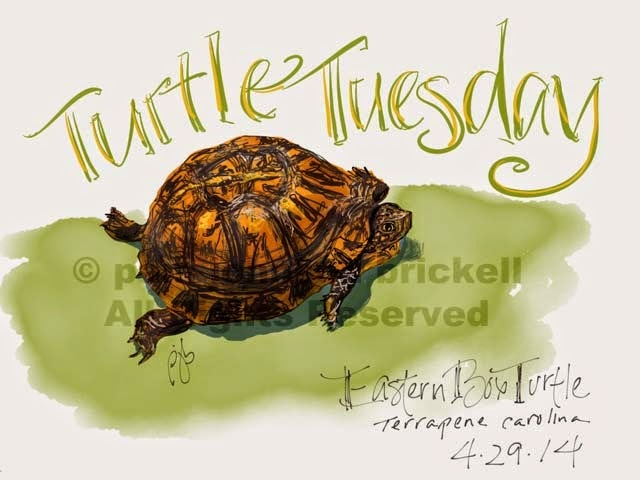 Now far be it from me to ignore the opportunity to sketch a turtle on a Tuesday! I chose to sketch it using the Paper 53 app, as next week David Rankin will be on the island conducting a workshop in which we will use the iPad/Paper 53 app in the morning and then create a watercolor from our sketch in the afternoon. Can't wait! • A key characteristic of box turtles is their hinged plastron (bottom of the shell) that can be shut completely to exclude predators. For more information on this turtle, please click the link on 'did you know' above. I keep a journal at work. Sadly, it doesn't get a lot of use. 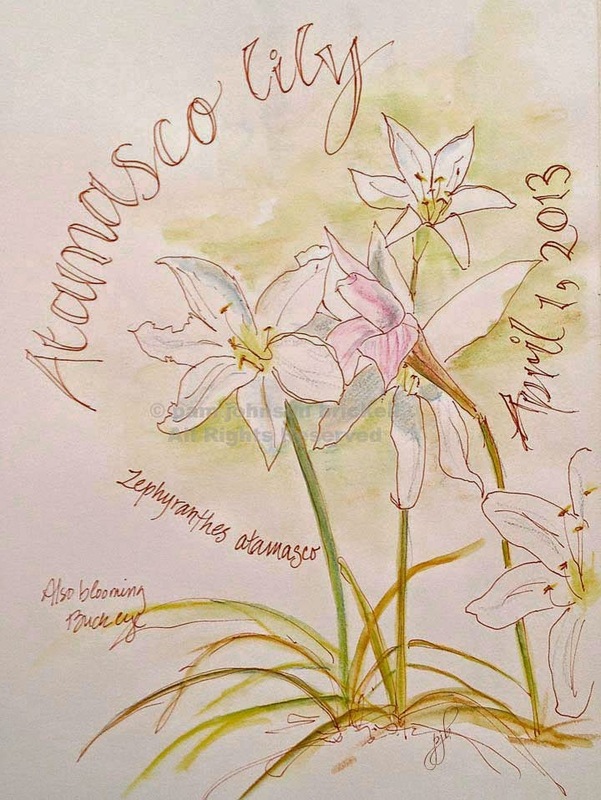 I ran across it the other day and found that I'd not posted this quick sketch made of the atamasco lily. I remember sketching the lilies in the field and then adding color and lettering back at the office. 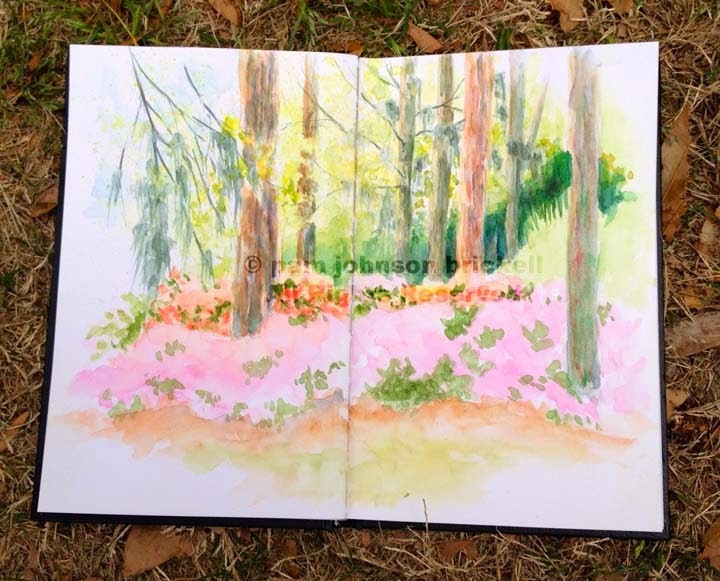 Sepia Micron pen and watercolor pencils in a Stillman & Birn Epsilon journal. At long last, spring weather has arrived! Last Friday, I made my way to a special area on Spring Island called the Trillium Garden. 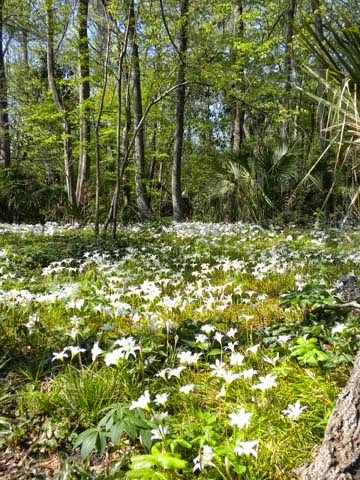 It's an amazing piece of property where spotted trillium, atamasco lilies, bloodroot and mayapples, Podophyllum peltatum, naturally decorate the landscape. This year, as part of my job, I will be illustrating the plants found here and creating a map of the area. My illustrations will be used to create outdoor signage and a brochure about the area. 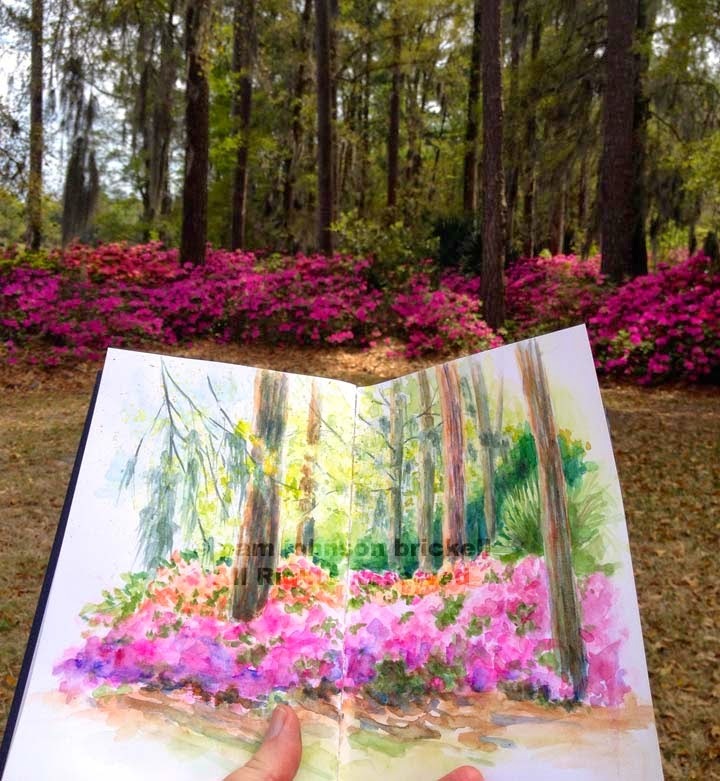 I must say my field sketch looks more botanical than sketchy. 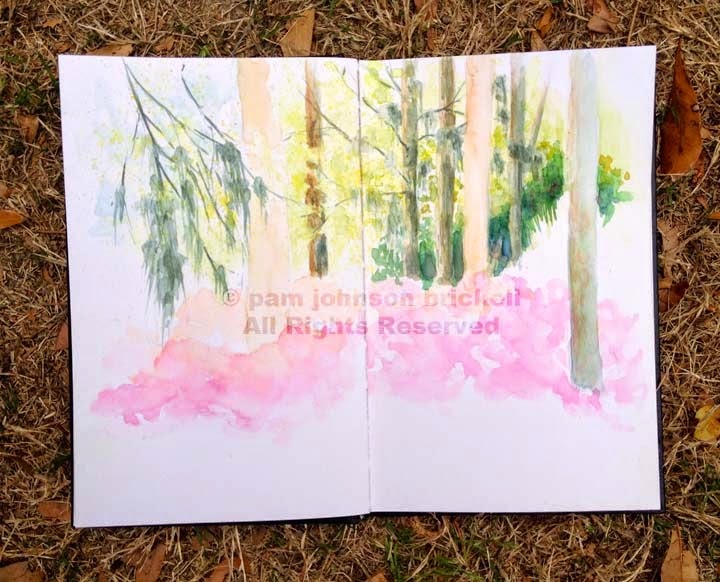 It took 10 minutes for the pencil sketch and I was finished with the watercolor portion in 35 minutes. I'm not a fast painter by any means. I paint a bit, wait for that to dry, look off into the wilds and relish in the moment, and then pick up the brush again. I was in the zone for sure. How could you not be sitting amongst the atamasco lillies with the soft breeze filling the air with their lily scent?? This piece is not finished yet. 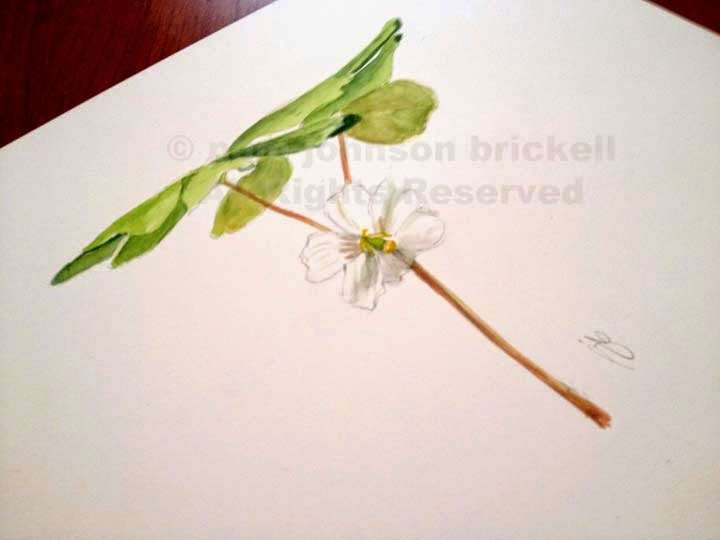 I want to add a 'crow's eye view of the mayapple to the page. You'd never know that this plant even had a flower when standing above it. They have 2 wonderfully shaped, large leaves. I took photos so I may finish this indoors, as I brushed one tick off of my arm (they fall from the trees) while painting this. I then found another under my shirt when I returned to the office! 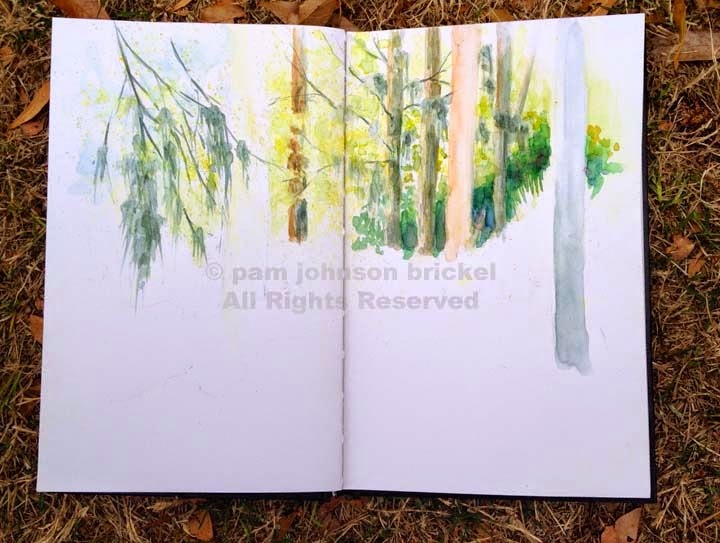 I love sketching and painting plein air - even with the challenge of bugs. 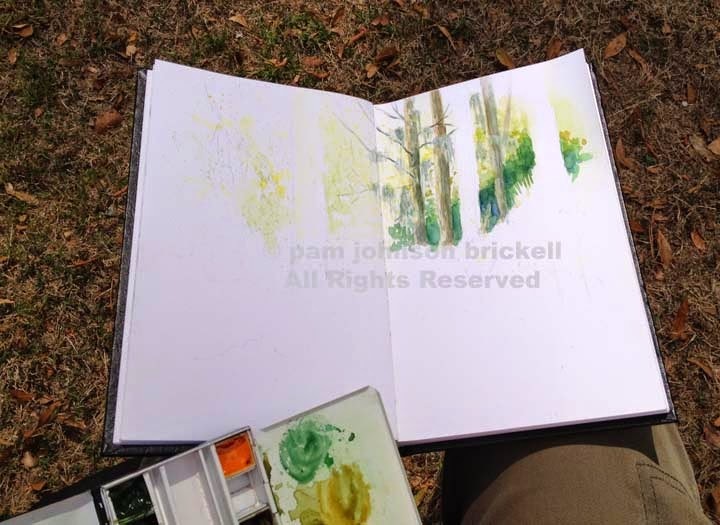 I don't always have the time to complete a piece, but if I can at least sketch it live, and then add color from a reference photo, I still feel the magic of the plein air moment as I work within my original pencil marks. • Native Americans had many uses for the mayapple. However, only the very ripe fruit is safe to eat. All other parts of the plant are poisonous. The ripe, egg shaped fruit will be yellow and kind of wrinkly. 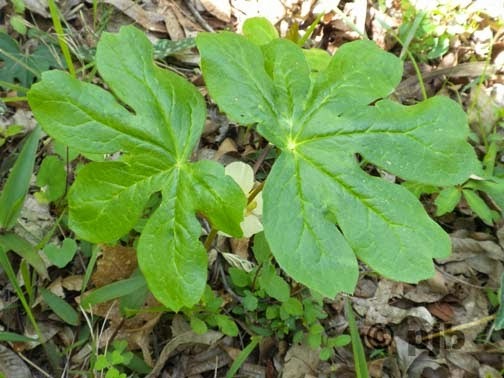 • Other 'local' names for the mayapple include: wild lemon, hog apple, Indian apple, duck’s foot, umbrella leaf, and wild mandrake though it is not related to the old world mandrake, Mandragora officinarum. I so love when weather and time cooperate so Rob and I can go off to do what we love most.... he, golf. I know..... hard to guess my passion isn't it :) On the other side of the trees is the golf practice range where Rob is happily wearing himself out. Here are images showing the process. 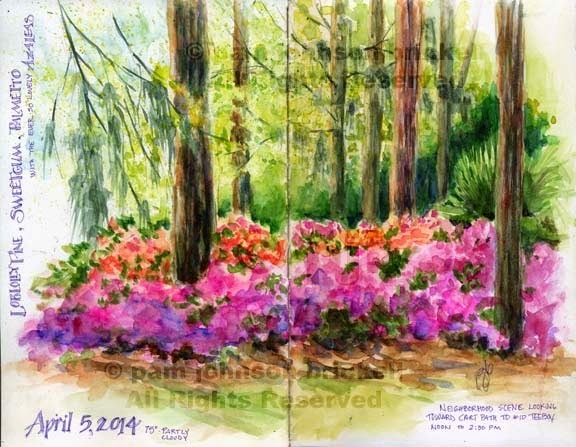 This spread is in my 5x7 Stillman & Birn, Zeta Series journal that I call 'My Book of Trees'. I added a few darks and descriptive copy once I returned home. We are thick into pollen season. For you in the North... hang tight. Spring weather will arrive!